First map to depict the Spottswood plan for German settlement in the Virginia interior. An exceptionally beautiful example of J. 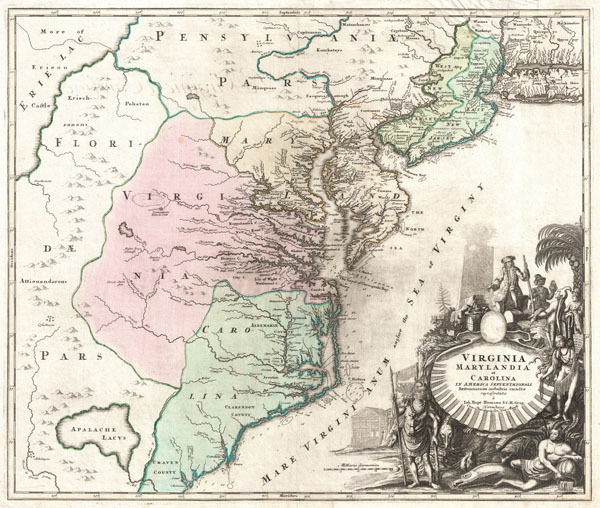 B. Homann's c. 1715 map of Virginia, Carolina, Maryland, and New Jersey; considered one of the most important and decorative maps of is region to appear in the 18th century. This fine decorative map covers from New York City and Long Island south along the Atlantic Cost as far as modern day Georgia, and as far west as Lake Erie. Homann drew this map in response to Virginia Lieutenant-Governor Alexander Spotswood's plan to settled the little known interior of Virginia with German immigrants. Shown here is the first mapping of Germantown Teutsche Statt on the Rappahanock River and Fort Christanna (Christ Anna Fort) on the Makharing River. Fort Christanna was built with the intention of defending the region against incursions from hostile American Indian groups such as the Tuscarora to the west. Christanna also acted as the headquarters of the Virginia Indian Company, a stock venture founded in 1714 with the intention of trading with indigenous groups in the interior. Though Homann's remarkable representation of Spottswood's plan is extraordinarily up-to-date considering that Fort Christana was founded in the same year that this map was initially published, the remainder of the map embraces a number of common misconceptions and cartographic inaccuracies common to the region. Probably the most notable of these is his inclusion of Apalache Lacus. This fictional lake, the source of the May River, appeared on maps of this region since the mid 16th century Le Moyne-De Bry map and was popularized by Mercator and Hondius in 1606. It would remain on maps well into the mid 18th century before exploration and settlement finally disproved the theory. Further north Lake Erie and been expanded dramatically and shifted somewhat to the south where it takes on the appearance of a vast inland sea occupying the entire northwestern quadrant of the map. This region, west of the English colonies and north as far as Pennsylvana, Homann attaches to the Spanish claims in Florida. Homan's also offers a wealth of detail along the Atlantic coast, where most of the European colonization efforts were focused. From Long Island, about two-thirds of which is shown, south to Craven County, Carolina, countless towns and cities are identified. New York City is mapped on the southern tip of Manhattan Island, but is not specifically labeled. New Jersey is divided into the colonial provinces of East New Jersey and West New Jersey. Curiously Homann maps a large inland lake 'Zuyd Lac' straddling the New Jersey - Pennsylvania border. This is no doubt a early misinterpretation of the natural widening of the Delaware River at the Delaware Water Gap. Heading south along the Delaware River Philadelphia is identified and beautifully rendered as a grid embraced in four quadrants. Both the Delaware Bay and the Chesapeake Bay are rendered in full and even include a number of undersea notations and depth soundings. In Virginia and Carolina the river systems are surprisingly well mapped and a primitive county structure is beginning to emerge. The early Virginia counties of Rappahannock, Henrico, City, Isle of Wright, Nansemond, Northumberland, Middlesex, Gloster and Corotvk are noted. Similarly in Carolina a number of counties are named, most of which refer to the Lords Proprietors, including Albemarle, Clarenden, and Craven. Cape Fear, Cape Lookout, and Cape Hattaras are noted and a number of anchorages, reefs, and depth sounding are noted along the entire coastline. The lower right quadrant of this map is occupied by a fabulous decorative title cartouche. Centered on an enormous scallop shell bearing the map's title and Homann's Privilege, the cartouche features a number of stylized American Indians trading with European merchants. The wealth of the region is expressed by an abundance of fish, game, and other trade products. Curling behind the scallop shell is a gigantic stylized alligator looking like nothing so much as a mediaeval dragon. The inclusion of Homann's Provildge in the title cartouche helps us to date this map to about 1715, when Homann was granted the right to add this royal distinction to his maps. Published by J.B. Homann in his Atlas Novus. This map appeared in various Homann atlases from about 1714 to 1730. Homann, J. B., Altas Novus, c. 1715. Very good, near flawless example. Minor closed repairs extending about one inch into the map along the Hudson River. Original centerfold almost indiscernible. A few old manuscript notations on verso. Cummings, D., The Southeast in Early Maps, 156. Prichard, M. B. and Taliferro H. G., Degrees of Latitude - Mapping Colonial Maerica, 17. Morrison, R., On the Map: An Exhibit and Catalogue of Maps Relating to Maryland and the Chesapeake Bay Honoring George Washington at the Beginning of the Third Century of Washington College at Chestertown, Maryland, #27. Phillips (America) p. 982. Van Ermen, E., The United States in Old Maps and Prints, #25. Papenfuse, E.C. and Coale, J. M., The Hammond-Harwood House Atlas of Historical Maps of Maryland, 1608-1908, p. 24, fig. 25. Library of Congress Geography and Map Division, G3700 1714 .H6 Vault. New York Public Library, Map Division, Map Div. 01-5082.